We get asked this question every day. At every conference. At every party. A while ago I was a guest on a podcast and when I listened to it later I couldn’t believe how boring the way I introduced my company was. We are taught to have an elevator speech ready that can explain the things we do in 30 seconds — the time it takes to ride up a few floors on an elevator with someone. The problem with an elevator speech is that it is typically self-oriented (and boring). By the time you finish the other person is thinking about their to-do list for the day and smiling politely as they wait for the elevator to open. 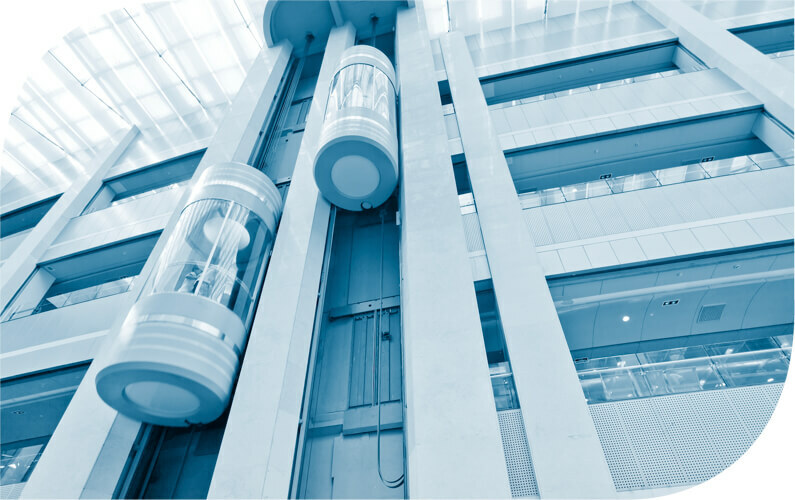 As Seth Godin likes to say, “no one ever bought anything in an elevator.” He also asserts the elevator speech takes all the tension out of the human interaction. Tension begs to be addressed. Tension drives us to curiosity and action. I recently saw a terrific presentation by crowdfunding expert Clay Hebert on how to introduce yourself. It is totally worth watching, but if you don’t have the time, here is the essence of his talk and his formula for introducing yourself or your company. Introductions are not about you! This advice may seem counter-intuitive. The person you are with just asked you what you do. Hebert asserts that we are much more effective if we focus on the people we help. By talking about how we help other people, your elevator mates will understand how what you do might be relevant to them. Keep it simple. Speak in language that a six-year old will understand. 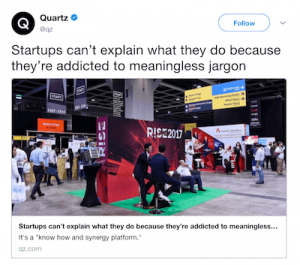 Hebert highlights a recent article in Quartz about how startups are terrible at explaining what they do because they resort to the industry jargon that nobody really understands. 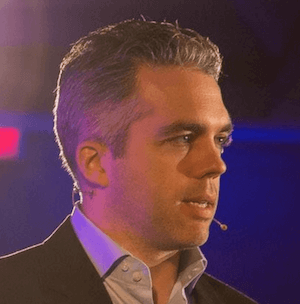 At a recent conference I subjected myself to the sales pitches of a many new digital startups. I often walked away completely dumb to what they actually did. It’s a conversation, not a resume. We are trying to get the person interested in learning more about us, or our company. Your organization’s name is often the first introduction to people who don’t know you. We once did some work for the Wisconsin Climate Change Action Initiative (13 syllables). People fell asleep by the time they got to the end of their name. We have noticed the tendency — particularly among nonprofits — that their initial name often stresses exactness over brevity. (We helped WCCAI become Cool Choices). Our natural tendency is to explain to people all the things we do. We focus on the exactness of what we do or our approach, rather than the change we are trying to create in the world. Hebert has a simple, powerful formula for introductions that use just five or six words. Simple. Powerful. And focused on the people you help rather than on you. Hebert offers some great examples to illustrate the power of this formula. 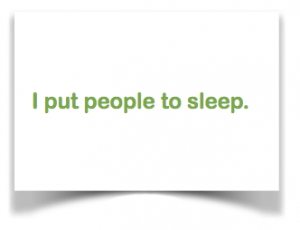 For example, Sleep expert Shawn Stevenson introduces himself with, I help people improve health through better sleep. Our brains are wired to remember things that are out of the ordinary. You can tweak the formula to make your introduction stick. Hebert suggests the sleep expert above could also say, I put people to sleep, (guaranteed to get a response!) or even, I help people in the bedroom.